The Earth is safe from the giant asteroid Apophis when it flies extremely close to our planet in 2029, then returns for seconds in 2036, NASA scientists announced today (Jan. 10). The chances of an impact in 2036 are less than one in a million, they added. Asteroid Apophis was discovered on June 19, 2004. 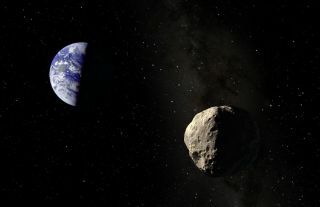 Now, new observations of asteroid Apophis recorded Wednesday (Jan.9) have revealed the space rock poses no real threat to the Earth in 2036, NASA officials said. Astronomers tracked the asteroid as Apophis made a distant flyby of Earth at a range of about 9.3 million miles (15 million kilometers). "Our interest in asteroid Apophis will essentially be for its scientific interest for the foreseeable future," Yeomans said. And that scientific interest will be high. When Apophis buzzes the Earth on April 13, 2029, it will come within 19,400 miles (31,300 km) of our planet. That's closer than some geostationary satellites, which orbit the Earth at a range of 22,370 miles (36,000 km), and will be the closest flyby of an asteroid the size of Apophis in recorded history, NASA officials said. Also on Wednesday, the European Space Agency announced that new observations of Apophis by the infrared Herschel Space Observatory revealed that the asteroid is about 1,066 feet (325 meters) wide, nearly 20 percent larger than a previous estimate of 885 feet (270 m). It is also 75 percent more massive than previous estimates, ESA officials said. The new observations of asteroid Apophis this week were made by astronomers at the Magdalena Ridge observatory, operated by the New Mexico Institute of Mining and Technology, and the University of Hawaii's Pan-STARRS telescope. The observations were combined with data from NASA's Goldstone Solar System Radar to rule out any chance of a 2036 impact. NASA astronomers regularly use telescopes on Earth and in space to search for any asteroids that may pose an impact threat to Earth.